This is a brief yet Important Announcement from all of us here at Krazy Deal Daze. 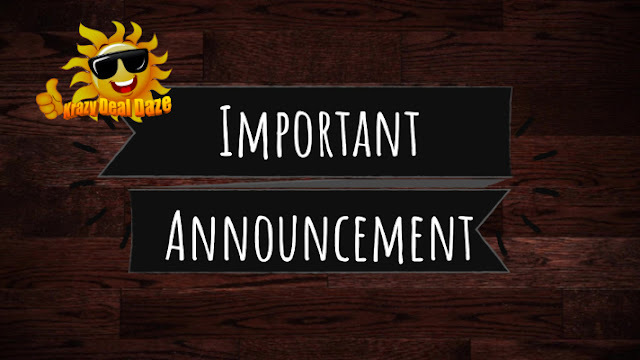 With the recent changes to the Amazon Giveaway Program, we have decided to postpone our monthly giveaways until we can find a better solution. We would also like to try and include our overseas readers and viewers in our future giveaways. Thank you in advance for your patience while we look for a solution. Thanks for stopping by to read our Important Announcement. Do you host giveaways? What is the best solution that you have found in hosting your giveaways? Please let us know in the comments below! Were there drastic changes made in Amazon Giveaway Program? I had no idea! Amazon's sweepstakes giveaway options use to be a winner was Randomly selected after Giveaway had ended, one entry per person and an unlimited number of people could enter for a chance to win. The giveaway would last 7 days. Now their sweepstakes option is a Lucky number giveaway. Lucky numbers are pre-chosen with the highest number being 1200. Which means as soon as the pre-chosen number is reached, that entry is the winner and the giveaway closes. Because of this change my last giveaway only lasted a couple of hours and most of my readers never had the chance to enter the giveaway.. I dont host give aways as mine is a personal blog. I often host giveaways using raffle copter, but im new to the game and always looking for alternatives. Thanks for the heads up! What happened with Amazon? I have never heard of the Amazon Giveaway Program but it sounds like it could be useful. I have only been blogging since May but the one giveaway I did worked well! Amazon's sweepstakes giveaway options use to be a winner was Randomly selected after Giveaway had ended, one entry per person and an unlimited number of people could enter for a chance to win. The giveaway would last 7 days. Now their sweepstakes option is a Lucky number giveaway. Lucky numbers are pre-chosen with the highest number being 1200. Which means as soon as the pre-chosen number is reached, that entry is the winner and the giveaway closes. Because of this change my last giveaway only lasted a couple of hours and most of my readers never had the chance to enter the giveaway.. I will keep an eye on it they may change it back. I didn’t know things had changed! I haven’t hosted a giveaway for ages. I've never tried hosting giveaway yet although it's something I'm hoping to do soon. Hope these changes get sorted out soon. I have never hosted a giveaway, but have been considering doing one for a while. What were the changes that were made?